September 28, 1870, a Wednesday, was a signal day in the history of Middletown. On that day alone, ten deeds were registered for the sales of properties on the Rancho Callayomi Spanish land grant. For the previous fourteen years, the rancho’s 8,242 acres, along with the Rancho Guenoc’s 21,200 acres, had lain idle, awaiting probate of the estate of Capt. A. A. Ritchie. Ritchie had been found dead in the road alongside his wagon in the summer of 1856. For 14 years, no one had been able to buy land in this area. Judging only by the indexing of deeds, the first buyers were Oscar Armstrong and John Henry Berry. Jointly the two paid $237.50 for 47.4 acres stretching south from what today's Main Street. Berry is credited with building the first house in Middletown, Armstrong its first saloon, catercorner at what we now know as the junction of highways 29 and 175. Berry and Armstrong soon purchased parts of adjacent properties to the north to bring their holdings to 80 acres. This became home to Middletown. Nine other parcels were recorded that day, and two more on October 1st. George McKinley added the westerly point of the Callayomi property to acreage he already owned outside the boundary of the rancho. James M. Hamilton, Ritchie's brother-in-law who had been advertising the acreage, purchased the largest parcel, some 313 acres. Young. Deeds were also issued to S. G. Butler; R. S. Deering; two deeds to John M. Collins and one to as-yet-unknown-given-name Lilley. C. M Young bought out the interests of his brother-in-law in 1871 and formed a commercial partnership with Oscar Arm- strong They contacted B. R. Wardlaw, who was widely admired for having surveyed and platted Sacramento, to layout the new town. Armstrong died in 1872 and his widow, Mary, continued as Young's active partner. Lots sold rapidly. Wardlaw himself was among the first purchasers, buying on what is today Wardlaw Street to become a founding resident and soon thereafter became county surveyor. South Lake County residents will recog- nize familiar surnames among these early pioneers. On Oct. 1, 1870, William Jasper Arm- strong, apparently a nephew of Oscar (they are listed as sharing a residence in the 1860 census), and his wife Anastasia bought 140 acres adjoining Berry and Armstrong's on the north. 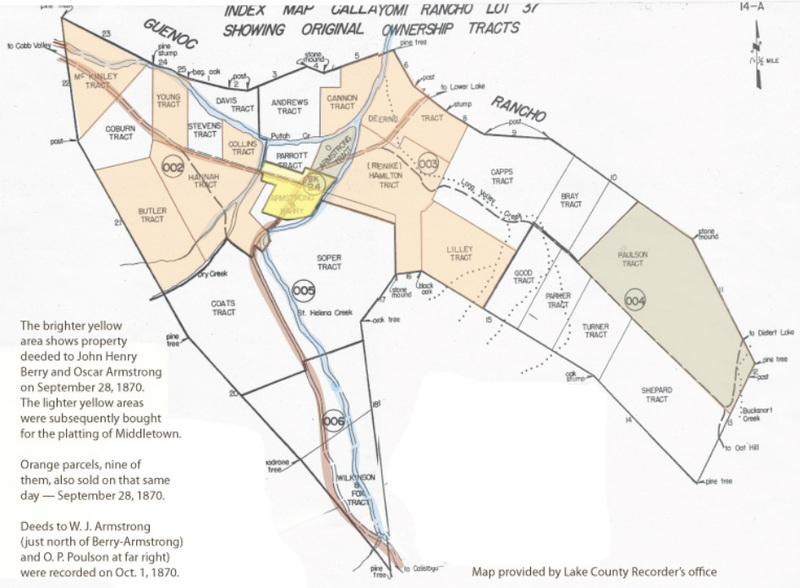 That same day a similar-sized tract, still abutting Putah Creek on the north but Dry Creek on the west, went to Eugene Parrott, a family name still familiar to residents in the Middletown area. And B. Oliver Poulson bought a large parcel at the most easterly end of the rancho. unclear whether original boundary lines or consolidated parcels are shown.